Back in 2008, Microsoft was internally testing a tablet PC with two displays, and the device would have featured a booklet design. The two displays with touch support faced each other in a booklet form and it also supported stylus (pen). Microsoft did work on Courier but the company never released it in the market. 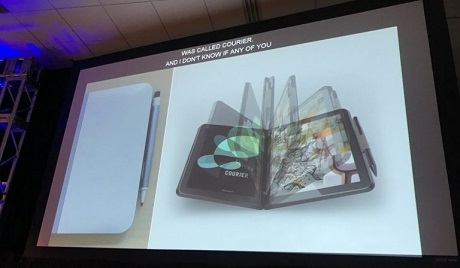 While Microsoft is working on a new mobile device similar to the Courier digital Notepad concept, but the company has always remained tight-lipped on the original and canceled Courier tablet. At Build 2018 developer conference, Microsoft revealed what exactly happened to the Courier project. The operating system of the Microsoft Courier was reportedly a custom version of Windows. Steve Ballmer decided to cancel such a device “because it didn’t have a clear platform or developer story”. “The reason Courier got killed was that it was another side project, it was another thing we were playing with and it didn’t have a clear developer story or clear platform story,” Friedman said. In other words, Courier was canceled because it ran a custom version of Windows, and it didn’t align with Microsoft’s vision. More can be found on OUR FORUM.